Hail and well met! We are the Figures in the Fog and today we’ll be reviewing the new cards for Ashes: Rise of the Phoenixborn, added in The Ghost Guardian . This is the fourth and final entry in this series. The other entries can be found at the following links: first, second, and third. Time is of the essence, so let’s get to business, we have 3 Ready Spells to cover today. The first Ready Spell is a new summon book, called Summon Ancestor Spirit. Summon Ancestor Spirit costs a Main Action, an Illusion class die and a basic die to play, making it the single most expensive summon Ready Spell in the game! The activation cost for Summon Ancestor Spirit is just placing an exhaustion token on the spell. But in order to get any benefit from the spell, the active player must either discard 1 card from their hand, or place one die from their active pool into their exhausted pool. Once the secondary cost has been paid, the active player may either place an Ancestor Spirit Conjuration on their side of the Battlefield, or draw 1 card. Ancestor Spirit is a deceptive Unit with 0 Attack, 1 Life, 0 Recover Unit with 2 abilities. The first ability is the same ability as Rose Fire Dancer, Distract. 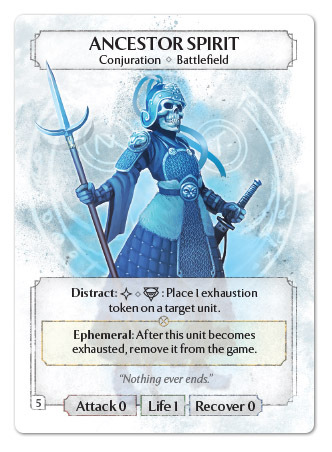 Distract is an exhaustible ability that requires a Side Action and placing an exhaustion token on the unit to activate, and then places an exhaustion token on another target Unit. The second ability is an inexhaustible ability called Ephemeral. Ephemeral triggers whenever an exhaustion token is placed on Ancestor Spirit, it gets removed from the game. Taken together, Summon Ancestor Spirit is a very unique Ready Spell. The thing that makes this card interesting, is how it inverts the economy of Ready Spells. Most Ready Spells, especially summon spells, have little to no upfront cost, but significant activation costs. Summon Ancestor Spirit is the exact opposite, with a very high upfront cost, 2 dice, and a very low activation cost, potentially just a card from the player’s hand. Combining that flexible cost with the Ancestor Spirit, effectively allows the active player to discard 1 card from their hand and exhaust an opponent’s Unit. And then there’s the Ephemeral ability, effectively limiting the number of uses of this spell to no more than 5. On the one hand, competitive Ashes games are unlikely to last more than 5 rounds, making the limit effectively meaningless. On the other hand, it definitely limits the scope of decks that Ancestor Spirit could be ran in. 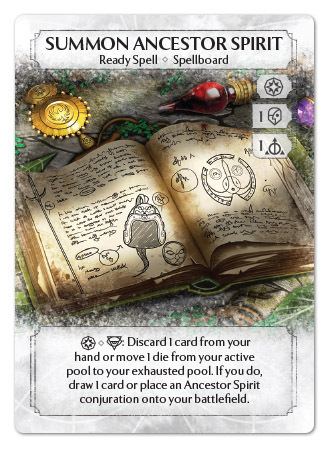 As much as a slower deck might benefit from a card like Ancestor Spirit, the card is going to lose a lot of value as the game progresses. X: This card has so much power and has so much potential, especially for Phoenixborn with low Battlefields. The biggest drawback is the huge upfront cost. Without some clever First Five selection to have a card to discard, starting the game with this card will likely cost you 3 dice. This it a relatively even trade, if your opponent plays a Hammer Knight or Sonic Swordsman, but if they play a bunch of smaller Units like, Psychic Vampire and Shadow Spirits, it could be a problem. This card feels like a fantastic card to overclock your Spellboard, but I don’t know if you want to make it a core Spellboard card. N: I really like this card. I’ve always thought Mirror Spirits were fun, but a little tricky to play, these guys might just help them be a little more competitive. Run them in Echo for extra synergy and fun. The next Ready Spell is a very powerful retaliatory tool, called Hex Bane. Hex Bane costs a Main Action and a Sympathy class die to play. 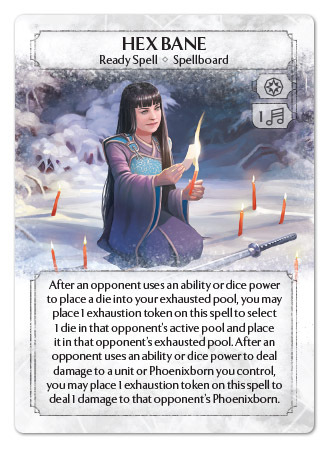 Once in play, whenever an opponent uses an ability or dice power to place a die from the active player’s active pool into their exhausted pool, they may place an exhaustion token on this card to select 1 die in that opponent’s active pool and place it in their exhausted pool. Or, if an opponent uses an ability or dice power to deal damage to a Unit or Phoenixborn the owned by the controlling player, they may place an exhaustion token on this card to deal 1 damage to that opponent’s Phoenixborn. Hex Bane is effectively a soft counter for both dice exhaustion and ping damage, in a single card. The first trigger is essentially limited to discouraging use of the Illusion dice power, making this card very strong against the heavy exhaustion archetypes for Harold, Jessa, and Victoria. The second part of this card has several more potential triggers, Ambush from Fire Archer or Stormwind Sniper, Natural dice power, Brennen’s Soul Burn, and Jessa’s Screams of the Departed, just to name a few. X: I love the design of this card! Not only providing defensive options for dice exhaustion, but also for damage to Units and Phoenixborn. And if that wasn’t good enough it provides unique penalties for both triggers. This finally gives players a way of hitting back when opponent’s go after their dice. Victoria will have to think twice about taking an opponent’s die, especially when said opponent has multiple copies of Hex Bane. The two minor complaints I have this card, are the lack of a way of forcing your opponent to trigger it, and the lack of flexibility for the damaging a Unit or Phoenixborn. It would have been very nice to have the option of damaging an opponent’s Unit, even if you hardly ever use that mode in practice. N: This kind of feels like two cards packed into one… which in this case I’m ok with, as I don’t think either effect by itself would be worth a card. Together, however, I think they make a really nice tech card. The only thing is I don’t know like running 3 since it will be a dead card in certain Match-Ups. And running less seems like you’re just diluting your deck needlessly. I’ll be interested to see where this card ends up. The final card from Rimea’s deck is a Ready Spell called Dark Presence. Dark Presence is another very unique and very powerful Ready Spell, costing a Sympathy class die and Main Action to play. After it’s in play, it constantly provides all Units that player controls the inexhaustible ability, Fog of War. Fog of War triggers whenever a Unit deals damage to an opponent’s Phoenixborn, the controlling player places the top card of the opponent’s draw pile on the bottom of the deck, and then discards the top card of that player’s draw pile. Then Dark Presence also has 2 Focus abilities. The Focus 1 ability can be activated using either a Side Action or a Main Action, as well as 1 basic die, and placing an exhaustion token on this card. 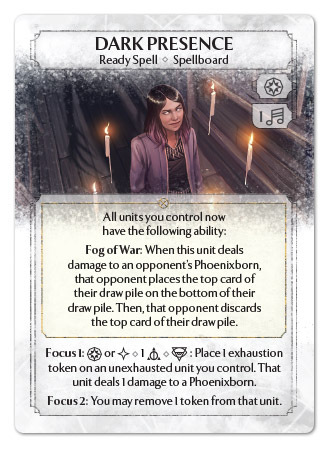 Afterwards, the active player may place an exhaustion token on an unexhausted Unit they control to have that Unit deal 1 damage to a Phoenixborn, triggering Fog of War. The Focus 2 ability, allows the controlling player, to then remove 1 token from the targeted Unit, namely the exhaustion token that was just placed. Much like the Indiglow Creeper is a key part of Koji’s identity, Dark Presence is a key part of Rimea’s identity. Pairing Fog of War with Rimea’s Visions, allows her to easily sift her opponent’s deck, virtually guaranteeing value out of every Fog of War trigger. The only question is how Rimea is going to trigger Fog of War. Fire Archer’s Ambush and Admonisher’s Rebuke abilities are probably the easiest, most reliable ways, especially given her low Battlefield. Outside of Rimea, this card loses a lot of value, due to the unknown order of an opponent’s deck. Statistically speaking, it is just as likely that the a key card will be discarded or buried through Fog of War as it is that it will be the card that was left on top. So it’s possible that Fog of War buries or discards an important card, but it just as likely that using Fog of War gives a card to an opponent. Thus Rimea’s ability to control what cards are going to be on top before triggering Fog of War is much better than not knowing what cards are getting placed where. X: Dark Presence is at the very least intriguing. I’m not certain that it’s worth building around, even in Rimea. Mill basically has to be a sledgehammer in order to be competitively viable. This is an attempt to turn the mill strategy into a scalpel, carefully cutting out key cards from your opponent’s deck. The problem is that your opponent has 25 cards and only 19 Life on average. And because Fog of War triggers on damage to a Phoenixborn at one trigger, they have 24 cards and 18 Life. So you are far more likely to threaten ending the game on damage, than you are ending the game due to mill. So I don’t think this card is worth building around as a win condition, but it could be very clutch in situations where you can deny some key cards from your opponent. In short, maybe include it if you are using a heavy ping deck, and have the Spellboard slot for it, but I don’t think that you should build a whole deck around it, even if your Phoenixborn is Rimea. N: I really want this card to be good in Saria. She’s always seemed slightly awkward with a Unique that is strong on board and an ability that’s good (well, ok) for mill. I’m hoping Dark Presence can help combine these two together into a solid wincon. It’s possible an Astrea deck with Admonishers that’s trying to go long might also have a place for Dark Presence, but I think spellboard in those style decks is already fairly tight. Well friends, it appears as though our time in this world is rapidly concluding. It has been our pleasure to share these exciting revelations from the world of Argaia with you. We hope you have enjoyed learning about these new cards, as we have had analyzing and sharing them with you. So before, we shed these mortal coils, let us know what you think of all these new Ready Spells? Which one is your favorite? What do you think of Rimea’s preconstructed deck? Tell us in the comments below, it will give us something to read as we wait for the next celestial alignment, or next Ashes spoiler season, whichever come first. Until then, we must Fade Away. The Figures in the Fog will return!